The booze options available at a majority of the 2,000+ Chipotle locations in the USA are just like that ladies clothing store in the mall: limited. There are margaritas on the rocks and some beer. But that could be changing sometime in the near future, as a single Denver, CO location is rolling out a slew of boozy (and non-boozy!) 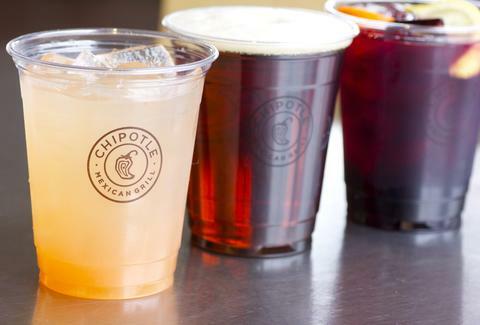 drink options that may one day make your Chipotle visits a little more fun. We're talking about custom-made beers from legit craft brewers and cocktails that go beyond the marg. Why is this a big deal here? Historically, the company changes its menu as often as cicadas come out of hiding -- as in, seemingly once every 13-17 years. Over its 20+ years in business, the big changes were adding Patrón margaritas and the Sofritas protein. But not much else. Until now. According to Richard Betts, a master sommelier from Aspen's The Little Nell, he's been assisting on the new beverage program for two years. And based on what the good people of Denver think of the drinks (if you live in Mile High, it's the 6th Ave and Broadway location), they may or may not be coming soon to a location near you. Or they'll be dropped from the menu, never to be seen again. We tasted them all. Obviously. Here's the rundown. Chipotle's Next Move: A New Burger Chain? 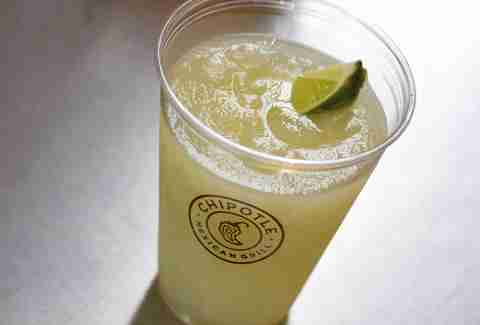 The margaritas available in most Chipotles are either Sauza- or Patrón-based, with triple sec, lemon/lime juices, agave, and ice. The company doesn't especially advertise the existence of said margs, but you can't miss the existence of its newfangled margarita, mostly because there's a huge frozen margarita machine next to the cash register. The new recipe swirling around inside that gleaming metal dream-machine has changed too: it's a 50/50 mix of Sombra mezcal and Astral tequila, lime juice, ice, and agave. The result is a margarita clearly superior to what's currently in the company's restaurants, though it's a bummer they don't salt the rims. Chipotle worked with the organic sangria-makers at Eppa to create a grenache and tempranillo grape-filled sangria that actually tastes like wine. Hooray for the drink not being a sugary mess! Betts is still tweaking the recipe, but for now there's a mix of pomegranate, blood orange, acai, blueberry, and citrus essences. And ideally it'll be available on tap, as it's more environmentally friendly than throwing out glass bottles whenever someone orders a sangria. Organically grown by In Pursuit of Tea, the agua de Jamaica tea is a blend of hibiscus flowers, rooibos tea, and lemongrass. You can just call it hibiscus tea if you don't feel confident pronouncing the phrase "agua de Jamaica." It's a traditional Mexican drink, and even though I only planned on taking a few sips, I kept going back for more. "One of the unique things about hibiscus is that it has its own acidity, its own structure," Betts said. "When you drink it, it makes your mouth water, it makes your belly rumble, it makes you want to drink more, and it makes you want to eat more." Perhaps this tea should come with a warning label that it's addictive. The black tea tasted unsweetened and was smooth enough, but the hibiscus was the real showstopper. 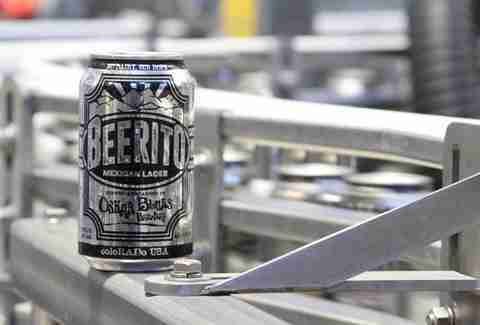 Colorado's beloved Oskar Blues worked with Chipotle on the brand-new Vienna-style lager Beerito (basically, it's a Mexican lager brewed with German malts). And the brew's name is not misleading -- this can will go perfectly with your next burrito. It should be a crime to drink this without guac and chips nearby. OB will start shipping it in cans nationwide, so feel free to taste-test it yourself. The company also added $2 cans of Modelo. As Betts told us, "I can't walk by the register and not have one. It's impossible." This is also a good excuse to remember if your boss catches you drinking Modelo at lunch. Back when I was younger and had significantly less facial hair, I'd tag along on errands to my mom's favorite natural food store, and sometimes I'd grab a Blue Sky. The brand's been around since 1980. All Blue Sky sodas are sweetened with cane sugar, as opposed to high-fructose corn syrup, and contain no caffeine. 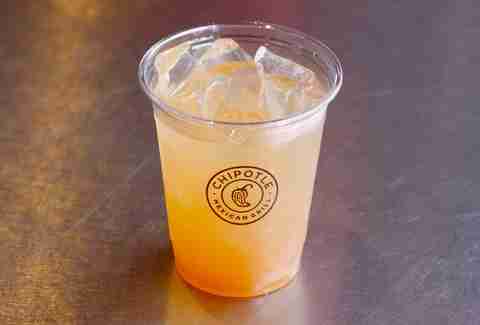 Having them in Chipotle locations would potentially be the first time they're available as a fountain drink, with the flavors including lemonade, ginger ale, and orange-mango. The orange-mango soda feels like it could add a bright note to any meal involving hearty ingredients like pinto beans and barbacoa or carnitas. Lee Breslouer is a senior writer for Thrillist, and needs more agua fresca in his life. Follow him to tweets fresca: @LeeBreslouer.